Legendary actor Humphrey Bogart and his estate, filed a law suit against Burberry last week. Burberry are in hot water for using Bogart’s publicity rights for an international campaign. Burberry insist that their campaign didn’t breach Bogart’s rights, and the image they used was licensed from a photography agency and in the domain for public use. 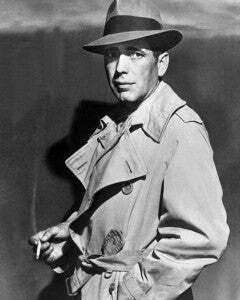 Burberry have used the picture of Bogart wearing one of their rather fashionable trench coats, which is similar to what Bogart was wearing in the last scene of Casablanca. This has been spread across social media sites and has been added cleverly into the Timeline section of Burberry’s pages on Facebook, to show that it has influenced fashion, culture and people over decades. Bogart’s estate is claiming that it never gave the fashion house permission to use that particular image in their campaign. Burberry have retorted that it is purely for editorial use and not to help sales. Burberry will stand by its guns in the fact that this particular image was licensed and was not used for commercial gain, where as the Bogart estate want justice. Burberry has used hundreds of famous faces in its campaigns and also use people such as Robert Mitchum on their Facebook Timeline. All of this because of a trench coat!